The moving targets of identity are not always dramatic or final. 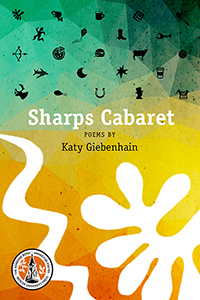 SHARPS CABARET brings us ex-expatriate poems. They enter—in one way or another—once-familiar territory. Here, when re-crossing oceans, streets, supermarket aisles, or exam rooms, the trip is always a trip. Something is always at stake. In SHARPS CABARET, Giebenhain handles the underestimated and overlooked with good-natured force. From horseshoe-pitching in a war zone to Mary the Mother of God speaking from an icon, from reading graffiti in a Prague restaurant to American health insurers acting like highway bandits, from the startling cleanliness of German windows to the introduction of the patron saint of the world’s most confusingly-named disease, here’s a collection that urges us to look again.